Ich habe schon lange nach einem guten Quiz Plugin für WordPress gesucht. Aber alle Plugins, die ich gefunden und getestet habe, haben mir nicht gefallen. Also hab ich mich kurzerhand entschloßen ein eigenes Plugin zu schreiben. Herausgekommen ist Wp-Pro-Quiz. Wp-Pro-Quiz ist ein neues, leistungsstarkes und schönes Quiz Plugin für WordPress. Es bietet verschiedene Antwortmöglichkeiten, unter anderem Single-, Multiple-, Sorting- und Free Choice. Das Demo-Quiz ist in Deutsch und Englisch (für WordPress.org), also bitte nicht wundern. Es zeigt ausschließlich die Funktion von Wp-Pro-Quiz. Hier kann eine Beschreibung bzw. Einleitung des Quizes stehen. This is german blog, that is why buttons are in german. Here you can find description or introduction of the quiz. Sie müssen eine Text angeben. Sie müssen dieses Feld ausfüllen. Hier wird die Frage notiert (Multimedia erlaubt). Dieser Text wird bei richtiger Antwort angezeigt (Optional). This text will be displayed with the correct answer (optional). Dieser Text wird bei falscher Antwort angezeigt (Optional). This text will be displayed with the incorrect answer (optional). Hier können Sie einen Lösungstipp hinterlegen. (Optional). Here you can enter solution hint. (optional). Sortierung: Sortiere die Zahlen der Reihenfolge nach. Was sieht man auf dem Bild? What do you see on this picture. 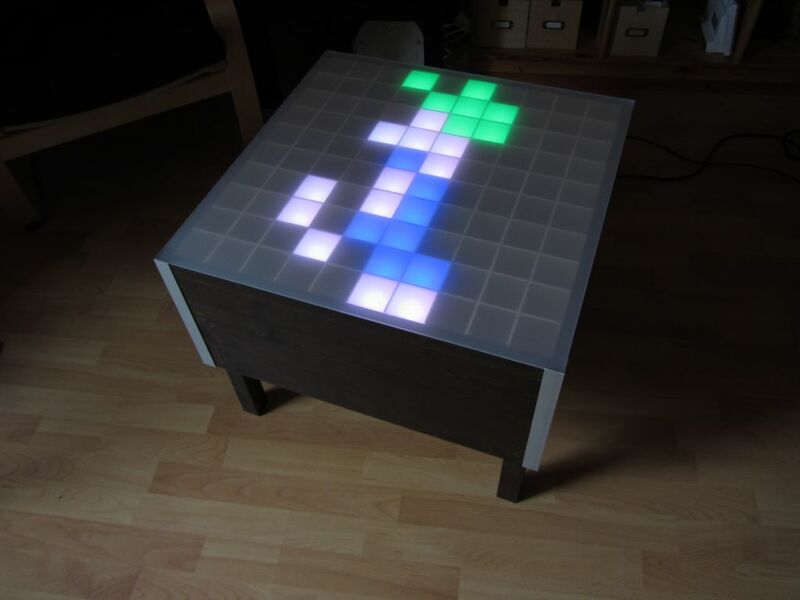 Correct, my 100 pixel LED table. Wrong, you see my 100 pixel LED table. Sortiere die „Sortierelemente“ zu den passenden Bildern. Order the „sorting elements“ to the appropriate images. (Android) ist ein Betriebssystem von Google. Die Version 4.2.x nennt sich (Jelly Bean). … is an operating system from Google. The version 4.2.x is called …. This is english blog, that is why the buttons are in english. / This is german blog, that is why buttons are in german. Punkte können nun auch pro korrekte Antwort statt nur bei korrekter Frage vergeben werden. Wenn diese Option aktiviert wird, werden alle Fragen untereinander angezeigt, d.h. alle Fragen stehen auf einer Seite. Wenn diese Option aktiviert wird, kann ein Benutzer das Quiz nur einmal absolvieren, danach wird das Quiz für diesen Benutzer gesperrt. CSS: !important in jede CSS-Eigenschaft hinzugefügt. Ich werde mein Plugin natürlich auch auf IT-Gecko.de einsetzten. Ich suche dafür noch paar Fragen. Wenn Euch paar gute Fragen einfallen, könnt Ihr mir gerne diese zu schicken. Es muss sich dabei aber um IT Fragen handeln. Ich hoffe, euch gefällt das Plugin. Bei Fragen oder Anregungen steh ich gern zur Seite. So was habe ich mir auch bei der Entwicklung des Plugins überlegt aber es erst mal verworfen. Ich bin mir noch etwas unsicher bzw. am Überlegen wie ich das am besten und vor Spam geschützt implementiere. Aber wie gesagt ist die erste Version und ich werde sich noch einiges hinzufügen. Naja, Bots die Quize ausfüllen wären ja genial – glaub aber eher weniger, dass es so welche gibt. Ansonsten die IP checken, ob die bei http://www.stopforumspam.com eingetragen ist oder Bestätigungsemail nach dem Abschließen des Quizes verlangen. Alternativ könnte man ja auch die Zeit überprüfen, wielange der gebraucht hat zum ausfüllen. <10ms pro Frage schafft glaub ich kaum jemand. Jo, so in etwa hatte ich mir das auch vorgestellt. Mal gucken wann ich dazu komme und dann werde ich so etwas einbauen. Aber wenn das wird das komplette Ergebnis übermittelt, d.h. nach dem das Quiz beendet wurde. Ob ich dann noch so eine Art Topliste einführe weiß ich aber noch nicht. This is by far the best quiz pluggin available. It’s even free! I have been looking for something like this for months. Thank you so much! Is it at all possible to allow users to keep resorting a sorting quiz until they get it right? Right now once you click submit the quiz ends. Version 0.3 ist nun verfügbar. Hinzugefügt habe ich eine kleine Statistik. In der Statistik kann man sich anzeigen lassen welche Fragen wie oft richtig oder falsch beantwortet wurden. But how would it work exactly? top-Plugin – wirklich super. Ich möchte das ganze als Gewinnspiel nutzen und bei erfolgreichem Abschluss einen Lösungsbuchstaben oder Lösungswort ausgeben.. Leider gibt es keine Option, einen Text abhängig von der Quote auszugeben. Wäre eine der Optionen denkbar? freut mich, dass dir das Plugin gefällt. Ich sitze gerade an der neuen Version und werde Option B einbauen. Es wird möglich sein maximal 15 Sufen anhand von Prozenten einzustellen, also z.B. ab 0%, ab 10%, ab 94,43% und ab 100%. Es bleibt erstmal dabei, dass jede Frage 1 Punkt entspricht. In der übernächsten Version wird es dann auch möglich sein für jede Frage unterschiedliche Punkte zu vergeben. Das werde ich erstmal nicht einbauen. Da es für mich kein Sinn macht. Denn der User kann das Quiz ganz einfach neustarten und solange probieren bis er es schafft. Version 0.5 ist nun verfügbar. Version 0.6 ist nun verfügbar. I just wondered, how can I change the language on the buttons etc (Question 1 of 7, Next exercise…). If I edit the wp-quiz-pro_de_DE file with POedit, will the plugin automatically use these translations? 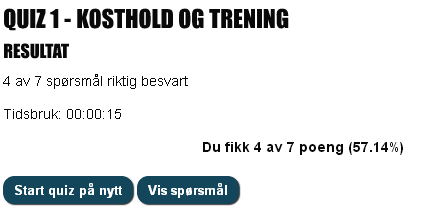 Thanks, Norwegian language now works! 1. Could you have a look at the page and start the quiz – you will see that the last answer in all of the questions is misaligned with the first ones. Any ideas? 2. How can it be that when I answer the questions correctly (have double-checked that correct answer is chosen in the editor), my score ends up only 1 out of 7?? Any ideas? Thanks for the language instructions – it worked! Do you know why the last answer in all the questions is misaligned (no space between circle and answer)? Also, when I answer all the questions correctly, the result tells me I have 1 out of 7 correct (I’ve checked that I’ve chosen „correct“ for the right answer in the editor). How is this possible? Thanks again for any help / ideas you can give. sorry for the late response. Akismet has blocked you. >Do you know why the last answer in all the questions is >misaligned (no space between circle and answer)? Check this Chrome and Firefox. >Also, when I answer all the questions correctly, the >result tells me I have 1 out of 7 correct (I’ve checked >that I’ve chosen “correct” for the right answer in the >editor). How is this possible? “Matrix Sorting” Choice answer type Display answers randomly error. Do you have any idea why this is happening ? Is another script blocking it or is something missing due to my template ? Thanks so much for the answer ! Have you tried [raw][WpProQuiz X][/raw]? Can you disable all other plugins and test again? Please check the footer.php file in the folder /wp-content/themes/Avenue whether the function wp_footer() is called. Perfect ! It works well now ! Thanks so much for the help and for this great plugin. I’m surprised it’s not yet into the best plugins lists ! For what I have tested, this plugin is excellent! More variety of question types than I have seen anywhere else. (1) Is it possible that the final result could be stored to the database so that registered users could track progress of completed quizzes? I would like an additional option that receive point for the correct match, not the entire issue in „Matrix Sorting“ Choice. can I send you a translation of the plug-in Russian? >I would like an additional option that receive point for >the correct match, not the entire issue in “Matrix >Sorting” Choice. You mean different points for each answer? There should be points for each correct answer and not for any proper question? >can I send you a translation of the plug-in Russian? I’ve send the file to your mail. Can you make the plugin to show only x% from 100% questions? I want to add all my questions on one quiz and when the user starts the quiz to show ramdom 25% from all questions. I’ve tried and tested the plugin. It is the only plugin must have in all educational websites. When will you release your next version that can save the user statistics in the database? If you have the beta version and needs tester I can do it. If you already have stable version, of course I want buy it. Looking forward from you soon. I am stuck. Ive worked on trying to get this plugin to work for hours. I have tried everything i can think of and I still can not get the WP-Pro-Quiz plugin to work on my wordpress test site. I am using wordpress 3.5 with the twenty eleven themes. I am evaluating a few quiz plugins and when I disable all the plugins except WP-Pro-Quiz, it is still not working. This is a basic test WordPress Site, as i am new to using wordpress. I am able to enter questions into the plugin. When I preview the test, I see the „Start Quiz“ button, but nothing happens when i press the „Start Quiz“ button. When I try and post the shortcode [WpProQuiz 1] or the [raw] [WpProQuiz 1] [/raw], it still does not work. When i enable the „Automatically add [raw] shortcode“ option, I see „[raw][/raw]“ tags displayed under the blog post for the test that i created, but no test shows up. Am i missing some components that are needed for wordpress to work with your plugin? The other test plugins i have tried seem to work, so I know my wordpress website is working. I just do not know what else i need to do to get this to work. Just a follow up. I have checked my tables in mysql server and I have data in the wp_wp_pro_quiz_master table. But i do not have data in the wp_wp_pro_quiz_question table. When I enter questions into the plugin, it tells me the questions are saved but looking into the sql table there isnt any questions saved. When i push on the quiz preview, no questions show up on the back end, but the time count down and says I have reached 0 out of 0 points. What do i need to check or do? Das Plugin ist spitze, aber wird vorgesehen eine Anmeldung einzubauen? Um Ergebnisse zuordnen zu können in der Statistik? Your plugin is by far the best of all! More interaction with BuddyPress please!! bug in “Cloze”: not correctly points calculated. Mix up scoring. beim Lückentext werden die Punkte bei der Gesamtpunktzahl nicht berücksichtigt. Beim Matrix Sorting wird am Ende kein Ergebnis angezeigt. Hi i did the translation to spanish,, How i can share it? das Plugin macht wirklich einen super Eindruck! Die „Quiz“ Möglichkeiten scheinen damit wirklich unbegrenzt! Kann man die Bestenliste bei jedem Quiz erstellen lassen? Wäre es möglich den „Tipp“ auf ne andere Seite im Blog zu verlinken z.B. nen „Wissensartikel“ damit der Nutzer dort nachlesen kann? Ist es in Planung „Joker“ einzubauen – also wie bei WWM? 50:50, 1 falsche Antwort weg oder ähnliches?? Ich danke für deine Antwort und natürlich für dieses wirklich mächtige Plugin! is it possible to add the option to use an external jquery? Can you design it as a gameshow „who is a millionaire?“? I am a teacher and using your plugin to add quizes to my website. Unfortunately, it is not possible to see the answers that people enter on open questions. Would it be possible in the statistics to show the answers of the registered users? This together with the possibility to grade the answers manually (correct / incorrect) would allow me to create statistics for open questions. Hallo, danke für das wp-pro-quiz. Ich habe grad ein Quiz aufgesetzt. Es wäre schön wenn der Anwender das Quiz zum Schluss bewerten könnten (Sternchen), ggf. Freitext. Vielen Dank für dieses tolle Quiz-Plugin. Kann man auch nach Gesamtdauer der Beantwortung die Bestenliste erstellen? Was ist wenn viele flott alles richtig haben? erst mal großes Lob zum Quiz. 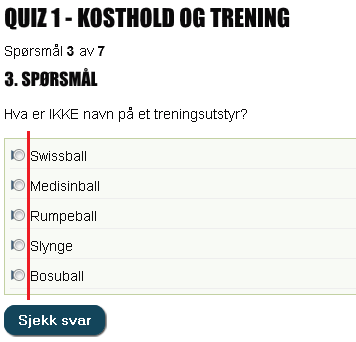 Ich überlege ob ich dieses Quiz für Klassen einsetze. Ist es möglich das Quiz mit Namen eines Schülers einzustellen ? zu können (grübel aber noch). Faellt dir da was zu ein? I have over 1500 questions I need to import. What is the .wpq file format. I can’t find it anywhere? also, ich habe sie alle getestet… aber dein Quiz-Plugin schlägt sie allesamt, und zwar um Längen. Sieht am besten aus und kann am meisten, Hammer! Ist derzeit mit einem Kennwort geschützt („stoprock2013“), da die Seite noch nicht live ist. erstmal hab nen schönen Dank für dieses Plugin. Ich hoffe, dass Import und Export von Daten auch unkompliziert sein wird. But i have one doudt, is there any way to publish my quiz result in facebook?? how i can do it.? What is a .wpq file?????????????????????? How do you create it?????? This question has been asked 3 times and completely ignored! 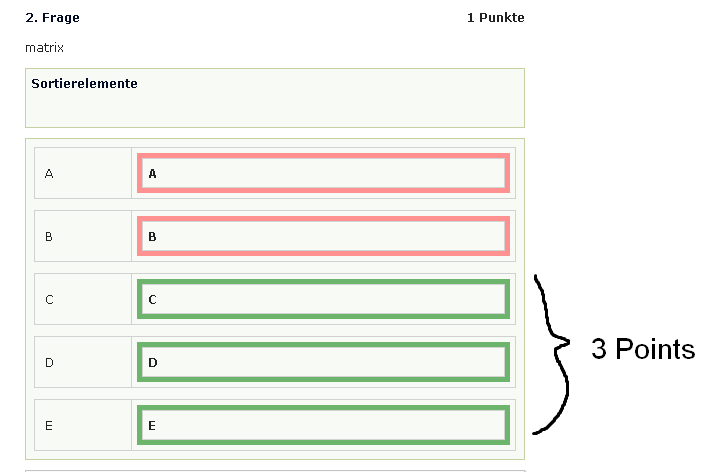 Ich möchte innerhalb eines CMS Beitrages ein Button einsetzten mit dem ich ein speziell erzeugtes Quiz starten kann. Auf dem Backend (Adminseite) kann ich das Quiz starten. Aber ich bekomme irgendwie nicht hin, ein Button auf eine Artikelseite zu bringen das das Quiz aufruft. Kann mir vielleicht jemand ein Quellcode Beispiel geben, mit dem ich den Button erzeugen kann um das Quiz zu starten. Awesome plugin, Thankyou very much for creating it. Please provide more info about quiz import export and .wpq format. @Joe: a .wpq file is WP-Pro-Quiz’s own export file format. When you go to the WP-Pro-Quiz section in the WordPress Admin panel, you’ll see the Import and Export buttons. Using Export, you can back up your quizzes into a .wpq file that you can then import at another time or on another WordPress installation. Ich habe verschiedene Quiz-Plugins installiert – und WP-Pro-Quiz ist das einzige, die gut funktioniert! Awesome plugin. How to stop quiz if students have wrong answer? Naja die Frage was Sehen sie auf diesem Bild. War Falsch das ist nicht war habe denn Tisch gesehnen un angefast. Can it be possible to directly load the quiz instead of clicking to enter the quiz. Please help with relevent answers. I am trying to use this quiz widget with CleanSpace theme, but it’s having problems. The answers cannot be selected when taking the quiz. And it looks strange. I’m not sure if the problem is with the plugin or the theme. The admin preview looks ok, but the production site has a plethora of errors. Do you have any insight on what could be causing this? I loved this plugin until the update where answer_json was taken away from the database and a new format started being used (.wpg). I used to be able to add directly in the back-end database w/ a .csv import. Could you please add an easier way to import questions? I have thousands I would like to use, but there’s no way I’m going to input each by hand. Something like .csv import or even going back to json would be awesome. Or even just providing a code snippet here for encoding it into the new format by asigning the answers to an array to loop through inserting them into the database; or after inserting the answers unformatted into the db? Will this be fixed and do you have an ETA? The plugin as it is now is useless to me and I hate that because it really is a great plugin. Thanks for all you do. Could you please let me know the process for implementing the same. 1) I have installed the plugin and prepared a test quiz also. How to link the same ? Ein echt starkes Plugin! Würde mich aber auch sehr über Infos freuen, wie man Fragen importieren kann, die nicht aus einem bestehenden Quiz kommen. Oder könntest du eine Dokumentation zur Verfügung stellen, in der die Zusammensetzung der Spalte answer_data in der Tabelle wp_wp_pro_quiz_question erklärt wird? Dann könnten wir uns auch über phpMyAdmin behelfen. Wäre klasse – danke im Voraus! Thanks for a great plug-in. Please keep up the great work. Just sent you a donation 🙂 All the best! hab mal eine frage zu dem gelungenem quiz plugin, betseht die möglichgeit für jede einzene frage eine bestimmte zeit einzutragen ? oder ist es nur möglich für alle fragen eine gesamtzeit einzutragen ? Is there any way we can configure a quiz so that the user has two (2) attempts at any one question. If they still get it wrong, lock that user out from attempting the quiz for 48 hrs. In Answer type area single choice, multiple choice, free choice etc… instead of textarea, is it possible to use wp editor(rich text editor like message with correct answer and message with wrong answer). Just uploaded wp-pro-quiz and it looks great. I would like to change the language to french (including the buttons of course) but cannot seem to find how to do it. I will keep looking but if anyone can point in the right direction it would be appreciated. I have implemented a pause and resume button in the quiz. Pause function is working good. But resume is creating some problems. if you interested to see the code, i can post it. hy,how can i change the language from english to spanish? I wasn’t able to find what the custom fields are meant for. They display nicely but what happens to the data entered, where does it go? I would like to use the custom fields‘ variables to use in the email sent to the administrator. Any idea how to achieve this? I wasn’t able to find what the custom fields are meant for. They display nicely but what happens to the data entered, where does it go? I would like to use the custom fields’ variables to use in the email sent to the administrator. Any idea how to achieve this? Super plugin und wirklich gut zu konfigurieren!! Habe ich da irgendeine Stellschraube übersehen? Would it be possible to select different questions depending of the last answer. kann man beim Plugin auch die Anzahl der Fragen limitieren? Ich habe 40 Fragen eingetragen und die Zufallsfunktion aktiviert. Kann ich jedoch irgendwo die anzahl der fragen im Quiz auf 20 reduzieren? Hallo, ich bitte schon mal um Entschuldigung für die absolute Anfängerfrage: Wie und Wo kann ich die deutsche Sprache aktivieren? Wenn Name und E-Mail als Angabe nach dem Quiz angefordert werden und ich fülle nur das Namensfeld aus, kommt zwar die Fehlermeldung, dass die E-Mailadresse fehlt, aber man erhält trotzdem eine Bestätigung, dass die Ergebnisse übermittelt worden sind. Ansonsten nur großes Lob, das Plugin ist super! Hallo, das Plugin sieht sehr gut aus und hat viele Features für einen unterhaltsamen Quiz. Frage: kommt irgendwann auch die Unterstützung für italienisch dazu? erstmal *Bewunderung* für Dein super Plugin. Nachdem wir mit Hilfe Deines Programms zwei Tickets verlosen wollen, stelle ich nun voller Schrecken fest, dass zwar alles funktioniert, Leute teilnehmen und alles richtig beantworten, ich aber keine Ahnung habe, wer diese sind, obwohl ich über die benutzerdefinierten Felder Name, Adresse und Tel./Email abfrage. Gibt es eine Möglichkeit, diese Daten in die Mail, die ich mir schicken lasse, aufzunehmen? Möglicherweise in der Art wie $Adresse, $Telefon, etc.? Über eine rasche Antwort würde ich mich sehr freuen, da es bei uns nun doch extrem drängt! Vielen Dank schon mal dafür! I am looking for a wordpress quiz plugin to support a chinese language website that will be a virtual online textbook. wp-pro-quiz is the best quiz plugin that I can find, but I need additional features. Is it possible to pay you, your staff, or someone you recommend, to add new features to this plugin? Custom fields are bugged. When I save a second quiz with custom fields, the first quiz looses all custom fields. I need all to have same custom fields but now it appears only one quiz can have custom fields. Your help is appreciated – your plugin is GREAT. There is some kind of bug, when the start button doesn’t work somewhy. Could you solve this problem, please. Thanks for you great work and cool plugin. Eine Frage: Kann man das Plugin auch bei einem Theme mit Responsive Design verwenden (ich plane Twenty Twelve)? Hi, thanks for this plugin, it’s amazing! I really love this quiz but lately my quizzes are disapppering. I spent a good portion of last night adding the quizzes only to find them gone this morning. Is anyone else having the same issue? Is there a bug that can possibiliy be fixed? Working with wp-pro-quiz is perfect, only by making custom fields i made an email field, where people fill in there email. Why isn`t it possible to send the result to that email adress (custom field). Also by making an quiz it would easy when all the dots will be next to the question. So all the question and (rounds) false   ….. are placed aside of it. hope to see youre update. 1. Is there a way for individuals to sign into the Quiz or Register for the quiz only. We don’t have registration into our website. 2. Is there a way to Auto send a Certificate in pdf with a date stamp when they pass, so they know when they have to re-certify 2 years from that date. 3. A comment section for them to tell us what they thought. We use them as Reviews for other clients to see or to make changes to the quiz. Is any of this possible? Thanks again. PS: … ist übrigens vermutlich tatsächlich das Beste Quiz-Tool in der WordPress-Welt. Du hast nicht übertrieben: die restlichen Tools sind an der Stelle leider nicht so dolle. Respekt! I love your plugin and I use it in my website. Until now your plugin doesn’t test the resultGrade value with the quiz result and always shows the resultText . Is it possible to change this behavior? Il’ll paid for this improvement! ein wirklich ausgezeichnetes PlugIn, macht viel Spaß damit zu arbeiten. Habe allerdings eine Frage, die ähnlich zu der von „Volker“ am 04. Januar ist. Wir wollen zwar kein Gewinnspiel veranstalten, aber auch wir wollen einen Test auf unsere Seite stellen, den jeder Besucher ausfüllen kann. Allerdings wäre es dafür wichtig, dass seine Daten mit der Email-Benachrichtigung an uns übermittelt werden, denn wir wollen ihm ja ein individuelles Ergebnis zuschicken. certainly like your web-site however you have to take a look at the spelling on quite a few of your posts. Several of them are rife with spelling issues and I to find it very troublesome to inform the reality then again I’ll surely come again again. ich weiß nicht warum aber seit ich die neueste Worpress-Version 3.9 habe, WYSIWYG funktioniert nicht in diesem Plugin. Hello! I’m trying to use this plugin but I don’t understand how it work. After setting the options I can’t see nothing. I can save the template but nothing else. What I have to do? The quiz description is required. I suggest to notify that. Ich hätte noch zwei Punkte die ich für unsere Page anpassen müsste. Weiß jemand wer so etwas machen kann? Gerne auch gegen Bezahlung. Beim Import hätte ich auch noch eine Frage: ich habe über 1000 Fragen zu naturwissenschaftlichen Themen. Viele Antworten haben Formeln von Microsoft Formel Editor…wie kann ich diese am besten importieren? allerdings habe ich ein Problem bei dem Plugin: Ich möchte beim Quiz unterschiedliche Fragentypen verwenden: z.B. 4 Fragen „Single Choice“ udn 1 Frage „Cloze“. ist das nicht möglich? denn dann funktioniert das Plugin nicht mehr!!! ich kann nicht auf das „Start quiz“ drücken. zunächst einmal vielen Dank für dieses klasse Plugin! Ich nutze WP-Pro-Quiz derzeit für Selbsttests im Gesundheitsbereich und es funktioniert hervorragend. Eine kleine Frage habe ich allerdings: Gibt es eine Möglichkeit, mit der auch Nich-Programmierer die Beschriftung des Start-Buttons ändern können? „Quiz starten“ ist für meinen Anwendungsfall halt wenig passend. Das Script ist wirklich gut geworden! Einfach strukturiert und übersichtlich. TOP! Einen Wunsch hätte ich vielleicht noch für weitere Versionen! Das Script gibt erstellt ja eh einen Prozentwert über die Richtigkeit der Fragen. Könnte man dieses nicht mit einer Bewertung verbinden? Zu jeder Bewertung noch ein kleines Bild dazu und die gängigen Buttons für soziale Netzwerke! Ala Facebook, Google Plus und Twitter. Würde ich voll klasse finden, da dadurch mehr Leute angezogen werden! Habe bereits das halbe Web durchforstet, aber keine Lösung gefunden. Erstmal danke für das Plugin, finde es super! ist das leicht zu fixen? wäre super! First of all, I really appreciate your great plugin. Is that possible to do the following changes or allow customisation for the buttons? 1. Can you make a customised “Start Quiz” button. Like “Start Test” instead of “Start Quiz” or allow replacing a similar word to „Quiz“ (like “Test”)? 2. At the end of the all quizzes, you are directed to “Quiz Summary” button. Can you put “Finish Quiz” (“Finish Test”) button straightaway instead of directing to “Quiz Summary” button first? This really is a great WordPress plugin. I’ve looked over the comments here and the WordPress Support comments and it appears that you are no longer supporting this plugin. If that is the case then I’ll have to use another quiz plugin. Ignore previous… I rebuilt the site and now it’s working ok.
kompliment, ich spende, tolle sache – wenn es auch einen export eines quiz (als backup etc.) geben würde, wäre ich dankbar – und ein button oben „neue frage“, ich muss dann immer scrollen. vielen Dank für das tolle Plugin. Ist es auch Multi-Site kompatibel? Vielen Dank für das tolle Plugin, wirklich sehr gut. Leider kann ich das Quiz nicht starten, wenn ich das Plugin Wp minify aktiviere. Wie kann ich den Fehler beheben ? First of all, thank you so much for this AWESOME plugin. In the initial startup, I have inserted custom field „email“ and also, in the setting, user email settings area, I have selected custom field but I could not enter the email address. And consequently, whoever enter the email is not getting the score/result at the end. Everything is working fine, except customer is not getting the email result. See sample screenshot in the link below. Can you have a look at it for me please? If the user is joined as a member of the site, it works but we are dealing with outside students to do the quiz and do not want them to be a member of the site. But we want to send them a quiz result. Any idea why the drop down email is not able to enter email address? I posted this question yesterday and I was hoping to see the reply but now I can’t even see my post so… I’m re-posting again. Everything is working except for the fact that when you choose to send notification to custom email, the drop down list to enter the email is not working. The following link is the screen shot. By the way, the quiz is absolutely wonderful. Hello! Great plugin, thank you! Is it possible to make sharing in socials (twitter, facebook, vk.com and other) with the test results? First of all, I really appreciate for your all efforts!! I Really am impressed by your Quiz plug-in!! First, I request you how I can translate this plug-in into Korean. Actually, I have experienced translation of a math software, GeoGebra. So I can do translation of your plug-in well. Second, I found some problem working with HTML applet. Thank you again and if you don’t mind, please reply to me. 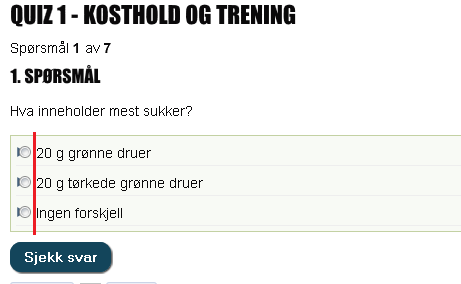 I have installed the plugin and set up a quiz quite successfully here: http://projektledelsen.dk/test-dit-team-testen/ (sorry – in Danish), but I am having trouble with the e-mail my respondents are supposed to receive. Even thought I have tried in text mode to insert line brakes, the text ind the mail comes out as one big block of text which looks awful. In the editor everything looks fine. Is there a trick for how to make it look better? Thanks! Du har netop taget quizzen „Test dit team“ og dit resultat er: 10 (66.67%) Nedenfor kan du se, hvordan dit resultat kan fortolkes: Resultat: 5 point eller under Der er masser af muligheder for at forbedre jeres måde at arbejde sammen som team. I gør alle sammen, hvad I kan, men I mangler at få en god struktur på definitionen af jeres opgaver og den måde, I afleverer opgaven fra den ene medarbejder til den næste. Både indtjening, effektivitet og kundetilfredshed kan bringes gevaldigt i vejret, hvis I arbejder med jeres proces og får en god struktur på plads. Resultat: Mellem 6 og 10 points Det ser fornuftigt ud. I har helt klart noget af strukturen på plads, og I har fokus på de rigtige områder. I kan vinde rigtig meget effektivitet ved at stramme endnu mere op på strukturen og få diskuteret en klar ansvarsfordeling af jeres opgaver, så I undgår fejl, som koster jer penge Resultat: Mere end 10 points Tillykke – I har ret godt styr på processerne! Husk på, at alle strukturer skal opdateres med jævne mellemrum – du må aldrig lave en struktur, der er så firkantet, at den bliver svær at arbejde med i praksis. Du kan overveje, om I har gode skabeloner sat op for de forskellige faser – det gør det nemmere at holde strukturen. can you tell me is there any solution to save state of quiz? I mean if user refresh / leave page – all data is lost. Is it possible to save data into DB automatically and restore it when student access again? i want to show name of categories in page. i don’t call it. Help me! I am starting out with some dev using this wonderful plugin. I would like some help with the project in understanding the code structure etc. I am willing to contribute the code modifications/improvements I do back to the plugin. I also want to contribute financially. Would you be willing to help me understand the code structure? Please drop me a mail if you find some spare time. I hope the modifications I have in mind will help keep the dev for this up-to-date and will provide a better experience. Gibt es die Möglichkeit (bei registrierten Usern) in der Bestenliste statt dem Namen des registrierten User auch den Namen einzutragen, der vorher im Custom Field eingetragen wurde? Wir wollen das für Schüler verwenden in einem geschützen Bereich, wo alle Schüler sich einen WP-User teilen, damit wir nicht für jeden Schüler einen WP-User anlegen müssen. I want a plagin that will create sets of quizzes. Visitors will buy them by sets online. Questions can be explained after completing the sets, meaning that explanations can be given in texts, pictures or in videos…. Questions will have five options. Each options will be either true or false. Visitors will get separate points (i.e. 1) for each options if answered correctly (true or false). Is it possible in your plagin??? I have build a quiz with WP Pro Quiz and I really like this plugin. Is it possible to show the point that an user win after each question, for each question ? (not only at the end of the quiz). Could you add for the WP-Pro-Quiz a button to save and add next question please? Showing the right and wrong answer.. along with description of the correct answer. Can you please create a template (text doc or ???) or a way that I can add bulk questions that would have all of the options included in my sample question at the url above? I will pay for the template – Please let me know. Ich mochte noch 1 funktion noch. Wenn mann seine anworten absendet, mann kann seine ergebnis in Facebook, twitter, google plus verteilen. Kannst du diese Funktion entwickeln? Is there a possibility to import tests from a Word document or even a simple structure with a program which can easily be entered questions and offered answers ….? Thank you for Wp-Pro-Quiz. I use it frequently and am building another site for an annual family quiz. There is one small item I do not know how to resolve. When finishing the quiz and I have it set so the results will be entered into the leader board the following phrase appears: „Your result has been entered into the leader board.“ with a Send button below. I believe the phrase should read, „Your results will be entered into the leader board.“ because I have to provide a name and email and then hit the Send button for the results to actually appear on the leader board. I do not know how to change that. Can you help me with this and I’ll send along that donation I have always promised that your good work deserves. Actually, I’ll send it along anyway. Ich möchte gerne die bestehende Bestenliste noch vor dem Start des Quiz für alles ausgeben ( Nick und Platz ), also unter dem Startbutton quasi – gibt es dafür ein Shortcode oder ein Script um es in die Seite zu integrieren? We run a quiz for students every month and i need to be able to display results by university, rather than by individual. Is there a way to show results grouped by university? About 1200 students from 34 schools take our quiz and the results ned to show the best university, by average score. I noticed that the plugin allows you to number each multiple choice option. Is there any way I could do this? Thank you. By the way, the plugin is amazing thank you for it. Wenn ich z.b 2 Quiz auf einer Seite einrichte. Startet nur ein Quiz obwohl beide Quiz angezeigt werden. Shortcode auf einer Seite im WordPress. Wenn ich eine andere Seite erstelle und den Shortcode [WpProQuiz 3] dort eingebe startet das Quiz. Was kann das sein oder was mache ich falsch? This plugin is Awesome.But now it’s stopped working in my website .please help me out . Nice plugin. Currently, only users with admin permission can create quiz. Is it possible for others with Editor, Author role to be able to create quizzes? Frage: Wo kann ich die Klasse des Buttons von „wpProQuiz_button“ auf „button“ ändern, so dass der Plugin das CSS des Themes nimmt um den Button zu stylen? ich benutze das Plugin ab und zu. Nun jedoch sedet es mir keine Mails mehr zu. Liegt es an der neuen WordPress Version? Oder wo kann der Fehler liegen? Ich habe an der funktionierenden konfiguration nichts verändert. das Plugin scheint wirklich wunderbar zu sein. Nur leider bekommt man nirgendwo mitgeteilt, wie man es überhaupt auf seiner Website eingebunden bekommt. SCHADE. I want to make set of questions, lets say 20, by level (novice,medium, hard) that are generated form a 500 questions database/per each level. Can be done with this plugin? I have created very nice quiz, but only one problem is there, I am not able to see the statistic of the user serially. I have complete three times quiz 2hours ago but the problem is I am not able to check the user. gibt es ein Plugin für Quiz, mit denen der Benutzer am ende eine Bescheinigung bekommt, auf die die Anzahl der erreichende Punkte darauf steht. ist es möglich, eine Art Wahl-o-Mat damit zu erzeugen? Dazu suche ich die Option „Antwort-Kategorie“n vergeben zu können. Es gibt 3 zur Wahl stehende Kandidaten, die zu gleichen Fragen unterschiedliche Antworten haben. Die Antwort-Kategorie wäre somit der Kandidat. Die Punkte werden am Ende des Quiz aufsummiert. Am Ende des Quiz sollte die „Wahlempfehlung“ erscheinen, welcher der Kandidaten die meissten Punkte bekommen hat. Hat jemand so etwas schon einmal mit WP-Pro-Quiz hinbekommen? ist es Möglich Personen die eine gewisse Punktzahl erreicht haben auf eine Seite weiter zuleiten ? My quizzes were working great and now they have stopped loading. I am devastated as I have about 100 users and I am being inundated with emails for support. I would buy you a very large drink if you would help me! Please this is really urgent. P.S. I love the plugin – but I really need to fix whatever has gone wrong. Super Plugin aber ich brauche Hilfe beim Import. Hat jemand den Import gelöst und kann ein Muster Datei zum Import posten? Thank you for Wp-Pro-Quiz. Would you kindly agree if i use it to help my customers building quizs ? WP-Pro-Quiz statistics is not working on new versions of WP. Thanks for your quiz plugin which is a very great piece of code. I had sent you a mail earlier with attachments. I wish to request for the cost of special customization. I would like to have an import function to import my quiz which are already in excel csv format. Please could you advise? Is there anyway to customize the custom fields text as well as the results text? Both are showing white text on white background. And the formatting of the table showing percentages is all weird. I really would like to use this plugin in my recent project as this is the one the best plugin for quiz related systems and easy to use. Can you please suggest if negative marking can be added to this plugin. i can pay for it if you guys can make a negative marking feature if someone gave wrong answer. „Du hast 5 von 9 Fragen mit Ja beanwortet“, das Ergebnis findest du unter „DSM 5,6“! Wie ist das zu bewerkstelligen? We want to be able set decriptive quizes in wp pro quiz ( wordpress )do you say me a ny news about making it able in future ? what means „free choice“ quiz may send me an example ? I like the plugin very much and I use it for my students to learn a language. Are you going to update the plugin, because it is not compatible with wordpress 4.8.2 and is causing problem with my theme (Divi). I hope you will. Otherwise I have to find another solution. Chief financial officers are forward thinkers. habe das Quiz seit Jahren im Einsatz und es hat auch immer toll funktioniert. Seit ein paar Wochen aber, werden aus dem Quiz die Ergebnisse, bzw. das Mail an den Admin nach einem Abschluss eines Quizes nicht mehr verschickt. Wordpress verschickt aber die Mails bei. z.B. der Registrierung, nur das Quiz schickt nicht mehr. Hallo Julius, bin gerade auf der Suche nach einem Quiz-Plugin, so ist mit das Wp-Pro-Quiz mehrfach über den gelaufen. Besteht die Chance auf ein Update von dem Plugin f. WordPress? Viele schreiben, dass es nichts besseres gibt in dem Bereich, aber das Update ist auch wichtig. Du kannst es auch kostenpflichtig anbieten, denke das wird auch funktionieren. Gibt es eine kostengünstige Möglichkeit Quizdaten zu importieren? Vielen Dank für dieses gute Plugin. Habe nun ca. 50 Quiz erstellt, mit Hunderten von Fragen. Hi, I would like to know if there is a way to receive the answers given to the questions in the email that communicates the result of the test. If not, is there an additional plugin to do this? Genau das, was ich gesucht habe, danke! Is it mobile friendly or not? well i had problems where the“start quiz“ button was not functioning and users could not start the quiz. If I saved you some time please go to my website http://www.agriedu4u.com and show me some love..!!! I am asking in english for english reading people to have the benefit as well. 1. I want to chance the name quiz to test in the button of my quiz. How can I do that? 2. I included the e-mail-option in my quiz/test. But if someone puts in his e-mail-adress. where does it end up? how can I connect this to my e-mail-provider? Hello. I just love the plugin it has all the features which i want. But their should be one more feature which i think is very important. The feature is that we should be allow to add negative mark for the wrong answer. In simple words you should add the negative marking system. Such that if a user choose a wrong answer the end of the test points should me minus from his total score. ich möchte einen Spielsucht Test erstellen und habe jetzt einige Plugins getestet, aber die meisten sagen mir nicht so richtig zu. Das Wp-Pro Quiz finde ich noch am besten. Gibt es bedenken wegen der Sicherheit, da es schon länger nicht aktualisiert wurde? I have used this plugin. this works very fine but one issue that I want to add answer in wp_editor because in textarea equation not comes. Hello. This is awesome plugin for making quiz which is completely available for free. Thank you for doing such a wonderful job. 2. Export the statistics data in csv format or any other format. Please consider these two suggestions. Hi, I’m using your WP PRO Quiz plugin on my site, but can it be shown on the home page ? Please let me know if we can also conduct POLL using the plugin. Currently the plugin consume more server resources on https://mykalvi.com which if you publish any guide on the same, would help many users. we need you come back !!! please, come with us again !! update for new version ! Ich habe ein recht großes medizinisches Lehr-Projekt mit diesem Plugin gbegonnen. Leider speichert das Plugin zwar Texte wie Fragen und Antworten, nicht aber bei „Single choice“ oder „Miltiple Choice“ die „Korrekt“-Angaben(Checkbox). Normalerweise lässt das System ja das speichern einer Frage ohne mindestens einer Angabe eines „Korrekt“ zu. nun ist es aber so das das System alle „Korrekt“ Angaben löscht. Das macht das Plugin derzeit unbrauchbar. Auch scheint es Herr Fischer nicht nötig zu haben auf mehrfache Anfrage zu reagieren. Echt schade, zumal das Plugin einmal recht leistungsfähig war.